CHICAGO--(BUSINESS WIRE)-- Hyatt Hotels Corporation (NYSE: H) today announced that a Hyatt affiliate has entered into a management contract with Rael Development Corporation for an Andaz hotel in Palm Springs, Calif. The hotel will join Andaz hotels currently located in top resort destinations including Wailea (Maui), Napa (Calif.), and Peninsula Papagayo (Costa Rica), as well as other world-class cities such as London, New York, Los Angeles, Shanghai, and Tokyo. 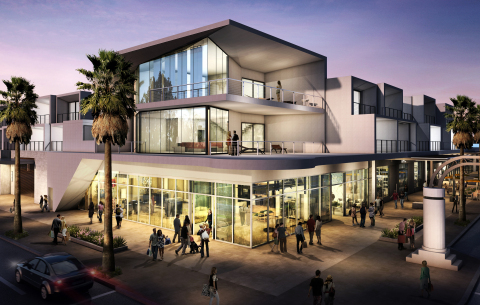 Andaz Palm Springs is expected to open in late 2016. Andaz Palm Springs will bring to life the brand’s mission of creating inspiring, indigenous experiences and immersing guests into the destination’s local culture. The 150-room luxury lifestyle hotel will be located in the heart of downtown Palm Springs, adjacent to the vibrant Uptown Design District and walking distance to the shops, restaurant and galleries that line the famed Palm Canyon Drive. The hotel will also be within walking distance of the Village Center and the convention center, and two miles from Palm Springs International Airport. Andaz Palm Springs is being designed to provide guests with a sophisticated urban resort experience. The 150-guestroom, 17-suite Andaz Palm Springs will stay true to its desert oasis destination. The hotel will be built as a collection of small buildings and guestroom bungalows surrounding two outdoor pools and garden areas on an elevated patio terrace, offering panoramic views of the majestic San Jacinto Mountains and city. Andaz Palm Springs will also feature spa services, a fitness facility, a signature restaurant and lounge, as well as an expansive elevated poolside retreat and terrace bar. The first level of the hotel site will include approximately 25,000 square feet of boutique retail space and intimate indoor and outdoor meeting facilities. Andaz Palm Springs will collaborate with local artists, musicians, designers, and other cultural influencers to deliver events and programs on themes unique to its location in Palm Springs. The Andaz Salon, the brand’s signature cultural program, features interactive, on-property and virtual events conceived to support and nurture each hotel’s community of emerging talent. The distinctive spaces at Andaz Palm Springs will stage creative Andaz Salon events, ranging from talks to exhibitions to live performances. These events can also be experienced through the Andaz Salon website at www.andazsalon.com, where unique content is shared by Cultural Insiders. Rael Development Corporation (Raelcorp) is a privately-held real estate company focused on the development, investment and management of commercial real estate. Founded in 1977, the firm has acquired and developed an array of trophy properties in select markets across the country. The company is guided by its experienced senior leadership along with a dedicated staff of veteran real estate professionals. The company maintains offices in Newport Beach, California and Dallas, Texas. For more information, please visit www.raelcorp.com.